One of the things I love about the house we moved into just over two years ago is the yard. I mean, it's smaller than our old yard (but still good size)...but there are numerous edibles that were already planted in the earth. Things that I can count on to pop up year after year without any work on my part. We have a couple of ever-expanding grape vines. There's lots of mint; while we all know how invasive mint can be, fortunately it grows under the grapes, so I don't mind a bit. We have chamomile. We have ground cherries (that I have yet to figure out how to beat the bugs and birds to, but one day...). We have purslane (or verdolagas) which is one of my favorites. But why, oh why, did I never make use of what is probably the most prolific feature of our yard - Yucca!? I just never really thought about it until I saw Hunger and Thirst using yucca blossoms. Well, duh! We have them in the front yard, the back yard, and on the side of the house. I need to brush up how to use each part. By the time I thought of it, I'd already missed the young, tender stalk (which looks a bit like...and here tell tastes a bit like...asparagus). I'm still looking into using the root...because if I use the root, doesn't that mean I won't have the plant anymore? Hmm...we'll see. But since the gorgeous, milky-white flowers are in bloom right now, I knew that would be a great place to start experimenting. The petals would make a great addition to fresh, raw salads. I think they taste slightly reminiscent of mild cauliflower. They also pair well with eggs, which is why I started with a simple egg dish. 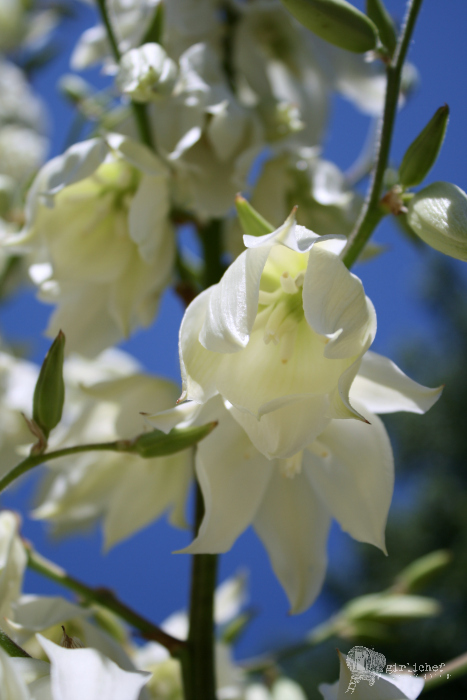 Although, I do think that using yucca flower makes it seem elegant. How crazy is that? A simple back yard ingredient transforming a dish to elegant...kinda backward if you stop to think about it. I can't wait to experiment with the abundant yucca that is waving in the breeze outside my window at this very moment. I need to find a use for the seeds...I usually use the dried pod as an ornamental in autumn. 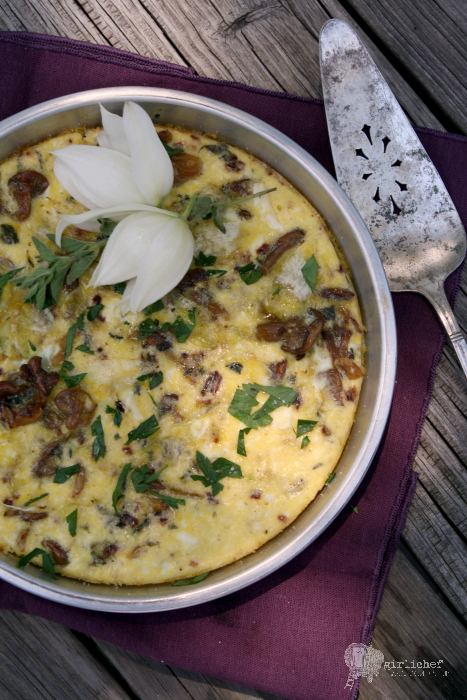 Until then, enjoy this frittata. 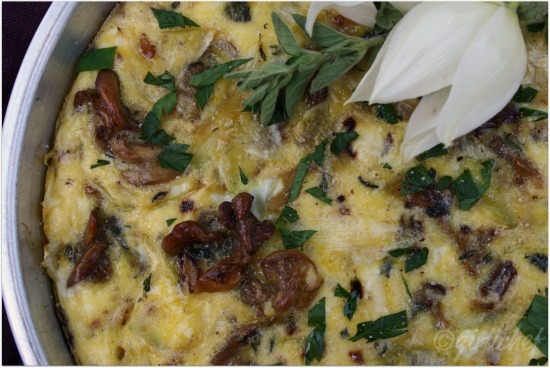 Tender yucca flowers, meaty mushrooms, and fresh herbs fill your senses with each bite of this frittata. Preheat oven to 350° F. Grease an 8-inch round or square baking dish. Heat olive oil in a medium-sized skillet over medium heat. Add shallot and sauté until soft, 2 minutes. Add mushrooms and turn heat up to medium-high. Sauté until they just begin to soften, another 2 to 3 minutes. Pick the petals off of the yucca flowers and add those to the mix, along with the oregano and thyme. Sauté another 1 to 2 minutes. Beat the eggs in a medium-sized bowl until just blended. Stir in the mushroom mixture and feta cheese. Season with a big pinch of salt and the black pepper. Mix it together and then pour into prepared pan. Slide into preheated oven and bake for 15 to 20 minutes, or until just set. 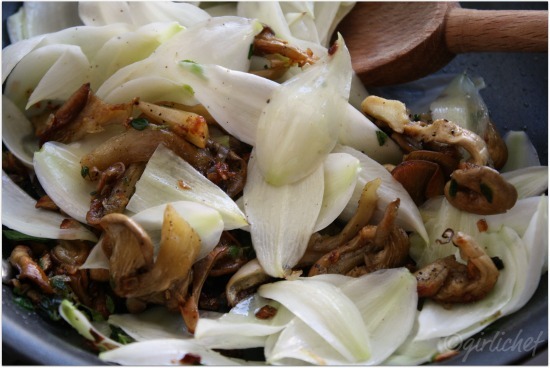 Garnish with parsley, a drizzle of truffle oil, and a few whole yucca flowers. Serve warm or at room temperature, perhaps with a simple leafy green salad and/or a croissant. I also grew these oyster mushrooms myself.